Bekal Fort is the largest fort in Kerala, situated at Bakel village in Kasaragod district, North Kerala and it is 67 km from Mangalore spreading over 40 acres (160,000 m2).The Fort appears to have been built up from the sea since almost three fourths of its exterior is drenched and the waves continually stroke the citadel. The Mukhyaprana Temple of Hanuman and the ancient Muslim mosque nearby bear testimony to the age-old religious harmony that prevailed in the area. The zigzag entrance and the trenches around the fort show the defense strategy inherent in the fort. 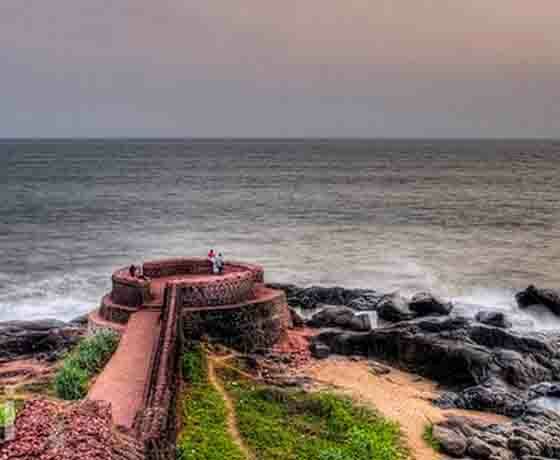 Unlike most other Indian forts, Bekal Fort was not a center of administration, for no remains of any palace, mansion or such buildings are found within the fort. Arguably the fort was built especially for fulfilling defence requirements. The holes on the outer walls of the fort are specially designed to defend the fort effectively. The holes at top were meant for aiming at the farthest points; the holes below for striking when the enemy was nearer and the holes underneath facilitated attacking when the enemy was very near to the fort. This is remarkable evidence of technology in defense strategy. Padmanabhapuram Palace is located in at Padmanabhapuram Fort, in Padmanabhapuram, Kanyakumari District, Tamil Nadu, India. Padmanabhapuram is the former capital city of the erstwhile Hindu kingdom of Travancore. It is about 20km from Nagercoil, and about 50km from Thiruvananthapuram, Kerala. The palace is complex inside with an old granite fortress around four kilometers long. 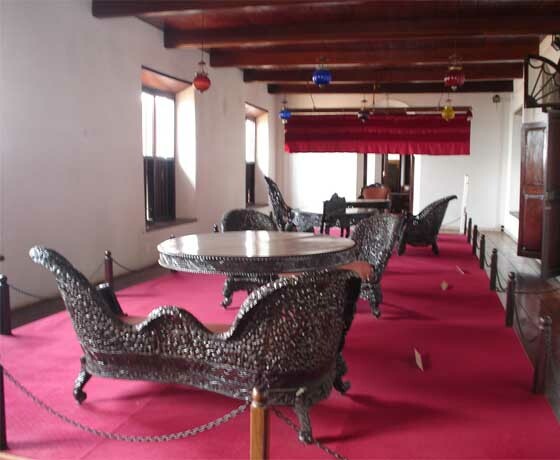 The palace is located at the foot of the Veli Hills, which form a part of the Western Ghats. Durbar Hall of the palace has a shiny black floor specially made from a combination of egg white, jaggery lime, burnt coconut, charcoal and river sand, granite tubs to cool curd and buttermilk, secret underground passages, the King's bedroom with a four poster medicinal bed, mural paintings, pictures of Lord Krishna, hanging brass lanterns lit continuously since the 18th century, open air swimming bath, granite dance hall, Saraswathi (goddess of knowledge) temple, large earthen urns, room for scribes and accountants, carved figures on columns holding oil lamps, pooja (worship) rooms with jackfruit tree columns, fish carvings on the ceilings, enormous teak beams, Belgian mirrors and an outer cyclopean stone wall fitted together without mortar. 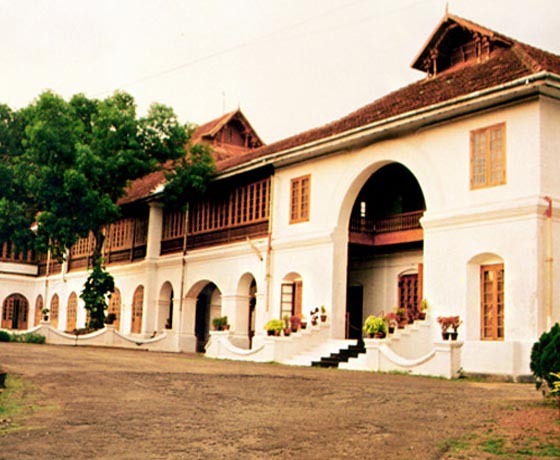 The Hill Palace, Kerala's first heritage museum noted for royal collections of the erstwhile Maharaja of Kochi, is today the largest archaeological museum in Kerala. Built in 1865, the palace complex consists of 49 buildings in the trational architectural style of Kerala, sprawled over 52 acres of beautifully landscaped terraced land which houses a deer park and facilities for horse riding. Numerous species of flora including rare medicinal plants grow here. On display in the full-fledged Ethno-archaeological museum are oil-paintings, murals, sculptures in stone and manuscripts, inscriptions, coins, belongings of the Kochi royal family and royal furniture including the simhasana (throne). Also exhibited are over 200 antique pieces of pottery and ceramic vases from Japan and China, Kudakkallu (tomb stone), Thoppikkallu (hood stone), menhirs, granite, laterite memorials, rock-cut weapons from the Stone Age, wooden temple models, plaster cast models of objects from Mohenjodaro and Harappa of the Indus Valley Civilisation. The museum also houses a gallery of contemporary art. Home Arakkal Kettu Arakkal Kettu was the palace of the erstwhile Arakkal Ali Rajas, the only Muslim royal family of Kerala. The palace is situated opposite the Ayikkara Moplah Bay, about three kilometres from Kannur town.The palace complex of Arakkal kettu comprises many independent units around a large open courtyard. It includes mosques and a building which was once used as an administrative office. Arakkal kettu is built of laterite blocks and wood; the intricate woodwork on most of the houses in the palace complex is striking. The palace, which has long verandahs in the front, has a distinctive look that speaks of a combination of local architecture with a colonial style. 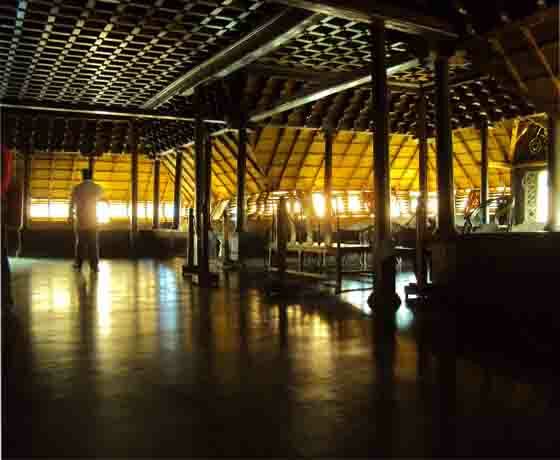 The main palace building is two-storied and the upper floor has large halls with wooden floors. The double shuttered windows of the palace have coloured glass panes that look lovely when they catch the light. One of the blocks is considered sacred and a lamp is always kept lit there. Such lamps, used by the Hindu community of Kerala as well are called Kedavilakku. A cot and a chair are also kept at this block.